Become a social media marketing superstar! Marketers and advertisers clearly recognize the power and importance of social media and are trying to quickly learn how to tap its potential. 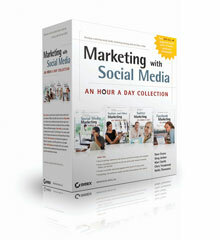 Marketing with Social Media: An Hour a Day Collection is the perfect bundle for marketers, advertisers, PR professionals, small business owners, non-profits and anyone else looking to design, implement and measure successful social media marketing strategies. Helps readers create a comprehensive strategy and teaches social media marketing best practices as readers launch, measure, and tweak the strategy. It covers everything from how to pitch the initiative internally to how to best use the available distribution and measurement tools. Turn customer conversations about your brand, product, or company into a competitive advantage with this practical guide from social media marketing expert Dave Evans. You'll discover the sweet spot of social media marketing, ways to pitch a campaign inside your company, the most effective measurement tools, and much more. The comprehensive guide for marketers wanting to reach Facebook's 500 million users. It explains how to leverage all that Facebook has to offer, everything from fan pages to events, applications, the Facebook advertising platform, and tools for tracking and measuring results. Plan and launch a successful Facebook marketing campaign by learning how to leverage everything Facebook has to offer, including great tools to help you measure and analyze to find out what's working. Get the very most out of fan pages, Facebook Connect, Facebook's advertising platform, and more. Features practical advice and step-by-step instruction for crafting a plan, attracting and engaging followers, leveraging contests and other promotional vehicles, and monitoring and measuring efforts. Leading social media expert Hollis Thomases shows you how to craft Twitter marketing strategies that can be scaled to any organization or market. Get to know your potential customers, start using contests and other promotions to engage followers, learn how to analyze your results, and find out more in this jam-packed guide! A program that helps readers craft a comprehensive video marketing strategy, use core video optimization and keyword techniques, produce content that looks professional and is compelling enough for readers to share, and successfully leverage all of YouTube's deep features, exploring everything from optimizing channels and video pages to using YouTube's analytics tools. Internet video expert Greg Jarboe helps you develop and deploy a comprehensive video strategy that works. You'll learn how to create and fine-tune your YouTube channel, how to choose keywords and optimize your video for search visibility, and how to create compelling videos that viewers want to share. Pinterest is the fastest-growing social media platform, with more than 80 percent of its users women between the ages of 25 and 54. Learn to reach this desirable market by following the advice in this step-by-step, task-based guide! It explains Pinterest's unique appeal and fundamentals, then shows how to develop a strategic marketing plan, set up an account, curate winning content, find followers and track and monitor Pinterest traffic. The popular "An Hour A Day" format uses a detailed how-to approach with case studies, tips, interviews and more. Pinterest Marketing: An Hour a Day gives you the know-how and the confidence to market your business on today's hottest social media platform.